NL2407 is suitable as a light duty garden washdown or water filler hose for recreation vehicles or pleasure craft (not for use with air). It is a lightweight, non-toxic, FDA approved hose (food grade) for drinking/potable water. Its cover is resistant to weathering, aging, and ozone. 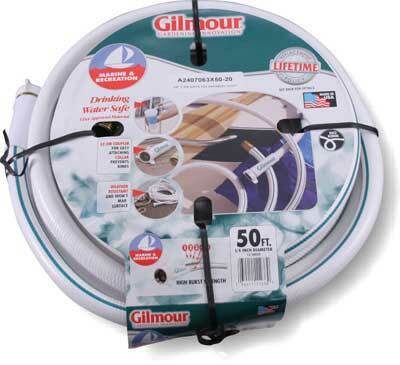 From our bulk hose inventory we can also offer an IAPMO certified hose (Kuritec Series 136) for applications used in internal plumbing/installation of drinking water lines in boat and RV manufacturing. Typical Fittings: N505-SS stainless or nylon N505-BR garden hose fittings, brass FBL ferrules, N66 pinch clamps, N64 gear clamps. Construction: Tube: Smooth, white PVC. Cover: Smooth, white PVC. Reinforcement: Spiraled synthetic yarn with a blue tracer.